Seller will give you a gift certificate in the amount of 66,519 RUB for a positive review of the product purchased. The phone, unlocked by this service, will never be blocked again, you can always update the version of iOS, do a reset, and use the SIM cards of any operators of the World. Other information as a result of checking by IMEI means that you have mistaken the operator / in the phone for another type of lock. It is forbidden placing an order for an unlock from another operator through this service. 3. 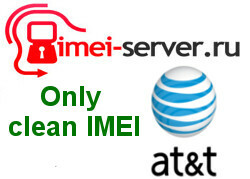 If you incorrectly specify IMEI or make an IMEI order that is locked to any operator other than USA AT & T, you will lose money for the wrong order. 4. Order for unlock without preliminary checks by IMEI will not be accepted into the process. The cancellation of such an order is possible after deduction of the commission of the Digiseller site, payment system and minus 15% of the cost of the service. 4) If the result is the Next Tether line: 23 US AT & T Activation Policy. Expect from us the information about the order fulfillment. Seller will give you a gift certificate in the amount of 66,519 RUB for a positive review of the product purchased..